This name uses Spanish naming customs: the first or paternal family name is Fernández and the second or maternal family name is López. Javier Fernández López (Spanish pronunciation: [xaˈβjeɾ feɾˈnandeθ ˈlopeθ]; born 15 April 1991) is a Spanish figure skater. He is the 2018 Olympic bronze medalist, a two-time World champion (2015, 2016), a seven-time European champion (2013, 2014, 2015, 2016, 2017, 2018, 2019), a three-time Grand Prix Final medalist (2014–15, 2015–16, 2011–12), and an eight-time Spanish national champion. He is the second man to break the 100-point barrier in the short program, the 200-point barrier in the long program, and the 300-point barrier in the total score. As of 24 May 2017, he has the second highest personal best scores in both segments and third highest in the combined score. Fernández represented Spain at the 2010, 2014 and 2018 Winter Olympics. He is the first skater from Spain to medal at an Olympic Games, ISU Championship or a Grand Prix event. In recognition of his achievements, Fernández received the Gold Medal of the Royal Order of Sports Merit by the Spanish government on 19 April 2016. Javier Fernández López was born on 15 April 1991 in Madrid. He is the younger of two children born to Enriqueta, a mail carrier, and Antonio, an army mechanic. Their father stated, "Between the two children we were spending €450 a month when my earnings were less than €1,500". When Javier went to the United States to train, Antonio took a second job repairing helicopters to cover the expenses. His older sister, Laura, competed in ladies' singles and ice dancing. Fernández intends to become a coach after his competitive skating career ends. He is a fan of Real Madrid C.F..
Fernández relocated to Hackensack, New Jersey in the United States in the late summer of 2008. He moved to Toronto, Ontario, Canada in the summer of 2011. Fernández started skating at the age of six, after his older sister began taking lessons. For a while, he also played soccer, tennis, and ice hockey, but dropped the other sports to focus on skating at age eight. He skated at a small rink in the San Martín district before switching a year later to a rink in Majadahonda. One of his earliest coaches was Carolina Sanz, who stated that he had natural talent but initially lacked discipline. Fernández landed his first triple jump at the age of 12. He had to leave Majadahonda after his sister decided to switch to the Jaca skating club, which offered to cover her costs. The youngest Fernández joined his sister in Jaca six months later. 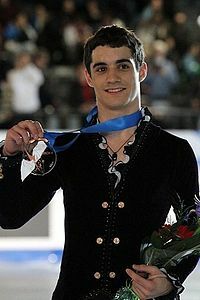 Fernández began skating in senior events in the 2006–2007 season, but failed to qualify for the free skate at the European Championships and the World Championships in his debut season. After two years in Jaca, where he had been teased and discouraged by a lack of improvement in his skating, he returned to Madrid and considered switching to hockey. In 2008, Fernández attended a summer camp in Andorra where Russian coach Nikolai Morozov was an instructor. Morozov offered to train him in the United States and Fernández quickly agreed. Fernández relocated to Hackensack, New Jersey in late summer 2008. Although he shared an apartment with a Spanish coach and Morozov charged him nothing for coaching, his expenses in the United States were between €2,000 and €3,000 a month and he received no financial support from Spain. Fernández had a breakthrough season in 2008–2009, finishing 11th at the 2009 European Championships and qualifying an Olympic spot for Spain with his 19th-place result at the 2009 World Championships. He was the first Spanish men's skater to qualify for the Olympics since 1956. Fernández received his first senior Grand Prix assignment, the 2009 Trophée Eric Bompard where he finished 11th. He was eighth at the 2010 European Championships, earning two spots for Spain in the following year's event. In his first Olympics, Fernández placed 16th in the short program, 10th in the free skate, and finished 14th overall. He was the first man in half a century to compete for Spain in Olympic figure skating – since the 1956 Olympics when Dario Villalba competed. Fernández set a new personal best score on his way to a 12th-place finish at the 2010 World Championships. He added the 4T to his jump repertoire in the 2009–10 season. Fernandez performs his Pirates of the Caribbean program at the 2011 World Figure Skating Championships. After Morozov moved back to Russia, Fernández trained with him in Moscow and also Daugavpils in neighboring Latvia. His assigned events for the 2010–11 ISU Grand Prix season were the 2010 Skate Canada International and the 2010 Cup of Russia. He placed fifth at Skate Canada and ninth at Cup of Russia. At the 2011 Spanish Championships, Fernández cut his hand during the warm-up and received medical attention for twenty minutes, leaving him no time to warm up again. He was unable to defend his title, placing second behind Javier Raya. Since Spain had two men's slots at the 2011 European Championships due to Fernández' result the previous year, both skaters were sent to Bern, Switzerland. Fernández fell twice in the short program, leaving him in eleventh place, but was able to move up to ninth after the free skate and once again earned two spots for Spain at the next Europeans. At the 2011 World Championships, Fernández landed two different quads, (toe loop and Salchow), in the free skate. He earned his first top-ten finish at the event, giving Spain two spots for the 2012 Worlds men's event. In June 2011, Fernández confirmed that he was no longer working with Morozov and would temporarily train in Canada with Brian Orser. This was due to instability resulting from Morozov's training group moving around frequently and Morozov's focus on Florent Amodio. He said that adding a quad to his short program and improving his basic skating were some of his goals for the 2011–12 season. Fernández at the 2011 Skate Canada International. Fernández finished 4th at his first competition of the season, the 2011 Nebelhorn Trophy. At an interview conducted at the event, he said that he would continue to train in Canada, with David Wilson and Jeffrey Buttle as his choreographers. Fernández and Orser said they were working on saving energy and improving spins, transitions and skating skills. His assigned events for the 2011–12 Grand Prix season were Skate Canada and Cup of Russia. At Skate Canada, Fernández executed the only clean quadruple jump in the short program to take the lead over Daisuke Takahashi and Patrick Chan. He placed second in the free skate and won the silver medal overall, exceeding his combined total personal best by over thirty points. He became the first Spanish skater to win a Grand Prix medal. At the Cup of Russia, he placed fourth in the short program, first in the free skate, and finished second overall with an overall total of 241.63 points — only 0.03 behind gold medalist Yuzuru Hanyu of Japan. Fernández became the first Spanish skater to ever qualify for the Grand Prix of Figure Skating Final when he qualified for the 2011–12 event. In Quebec City, he was third in the short program and fourth in the long to win the bronze medal, and in so doing, became the first Spaniard to medal at a Grand Prix Final. Fernández reclaimed his national title, winning by over eighty points. The remainder of the season proved less successful for Fernández. Although considered a medal favorite at the 2012 Europeans, he finished sixth. At the 2012 World Championships, Fernández placed fifth in the short program but dropped to ninth overall after the free skate. After these results, he agreed to perform full run-throughs of his programs more frequently in practice. Fernández started his season at the 2012 Finlandia Trophy where he won the bronze medal. His first Grand Prix event of the season was Skate Canada, where he beat defending Skate Canada and World champion, Patrick Chan, to take the gold medal. Fernández became the first Spaniard to win a gold medal in the Grand Prix series. Despite his fourth place at the 2012 NHK Trophy, he qualified for the Grand Prix Final. He finished fourth overall at the final after winning the free program with a 4S-3T jump combination, 4S, and 4T. He became the second European to execute three quads in one program — the first being Brian Joubert who landed a 4T-2T combination, 4T, and 4S at the 2006 Cup of Russia — and the first European to do so with a quad-triple combination. Fernández (center) claims his first Grand Prix gold at the 2012 Skate Canada, with Patrick Chan (left) and Nobunari Oda (right). In December 2012, Fernández won his third national title. At the 2013 European Championships he missed some practice time due to his skates being lost at the airport, but they were found one day before the start of the competition. Second in the short program, Fernández then placed first in the free skate, landing three quads jumps with one in combination. He won the gold medal and became the first Spanish skater to win a European title. He posted a new personal best overall score of 274.87 points. He later joked, "I have to make sure I lose my skates again!" At this time, Spain had just 14 indoor rinks and 600 registered figure skaters. At the 2013 World Championships in London, Ontario, Fernández placed 7th in the short program and 4th in the free skate. His total score of 249.06 points won him the bronze medal behind three-time World champion Patrick Chan and silver medalist Denis Ten. He became the first Spanish skater to stand on a World Championships podium in figure skating. In October 2013, Fernández was invited to skate at the 2013 Japan Open as part of Team Europe alongside Michal Březina, Adelina Sotnikova and Irina Slutskaya. He scored 176.91 points in the free program and won the men's event while Team Europe placed third. In the 2013–14 Grand Prix season, Fernández placed fifth at the 2013 NHK Trophy and third at the 2013 Rostelecom Cup, not enough to qualify for the Grand Prix Final. In December, he won his fourth national title. Fernández chose to use old skates after struggling with two new pairs of boots. He entered the 2014 European Championships in Budapest, Hungary, as the defending champion. He placed first in the short program with a clean skate, 6 points ahead of Russia's Sergei Voronov. His score of 91.56 was a new personal best at the time – the first occasion he crossed the 90 point mark in international competition. In his free skate, Fernández completed three quads (stepping out of the opening toe loop and the second quad Salchow), a triple Axel and five more triples, but doubled a Lutz and underrotated the second jump of his quad Salchow-triple toe loop combination. He scored 175.55 points in the segment, 267.11 points overall, and won the European title for the second year in a row. In February, Fernández competed in the men's singles event at the 2014 Winter Olympics in Sochi, Russia. He was the flag bearer for Spain during the opening ceremony. Earning 86.98 points in the short program, he placed third behind Yuzuru Hanyu and Patrick Chan, having stepped out of his quad Salchow and triple Lutz-triple toe loop combination. In the free skate, he landed a quad toe loop and a quad Salchow – the latter in combination – but tripled a second quad Salchow attempt. He went on to complete another triple Salchow as the last jump of his skate, which – having been repeated in the program – was rated as an invalid element, and received no points. He placed fifth in the free skate segment with 166.94 points, ultimately coming in fourth, 1.18 points behind Olympic bronze medalist Denis Ten of Kazakhstan. Fernández ended his season at the 2014 World Championships in Saitama, Japan. He skated a clean short program and earned 96.42 points, improving on his personal best in the segment by 4.86 points. He stood in third place behind Sochi Olympic champion Yuzuru Hanyu and Tatsuki Machida of Japan. He landed three quads in his free skate along with five triples, but singled a planned triple Lutz and added only a double as the second jump of his quad Salchow combination. He placed third in the segment with 179.51 points for a total score of 275.93, and repeated as World bronze medalist, behind Hanyu (gold) and Machida (silver). Fernández originally planned to sit out of the Grand Prix series but decided to take part after he found out that the Final would be held in his home country. Fernández began his Grand Prix season with a silver medal at the 2014 Skate Canada International, finishing eleven points behind Japan's Takahito Mura. Defeating Russia's Sergei Voronov by thirteen points, he won gold at the 2014 Rostelecom Cup and qualified for his third Grand Prix Final. At the Final, held in Barcelona, Fernández placed fifth in the short program after he fell on his quadruple Salchow jump, doubled the first jump of his planned tiple Lutz-triple toe loop combination, and stumbled during connecting steps. He scored 79.18 points, trailing leader Yuzuru Hanyu by almost 15 points. He recovered to place second in the free skate, again behind Hanyu, with a program that included two quad jumps, six triple jumps, and level-four spins and footwork, but he tripled a planned quad Salchow jump and singled a triple Lutz jump. He scored 174.72 points in the free skate, and 253.90 in total. Overall, he won the silver medal behind Yuzuru Hanyu. Fernández (center) atop the podium at the 2015 World Figure Skating Championships with Yuzuru Hanyu (left) and Denis Ten (right). At the 2015 European Championships in Stockholm, Fernández took the lead in the short program after he stepped out of his quad Salchow and the second jump of his triple Lutz-triple toe loop combination, but completed a triple Axel jump and level-four spins and footwork, scoring 89.24 points in the segment. In the free skate, he completed a quad toe loop and six triple jumps, but fell on a quad Salchow jump attempt and tripled another. Despite the errors, he won the free skate with 173.25 points, more than 15 points ahead of Russia's Maxim Kovtun, and claimed his third consecutive European title with a total of 262.49 points. Fernández skated a clean short program at the 2015 World Championships in Shanghai, which included a quad Salchow, a triple Lutz-triple toe loop combination, a triple Axel and level-four spins. But his step sequence was rated level-three and his triple Axel was not perfect. He earned 92.74 points and stood in second place, less than 2.5 points behind Yuzuru Hanyu. He produced a free skate with two quads, six triples, level-four spins and level-three step sequence. His only major error was a fall on a quad Salchow attempt. He placed second in the segment with 181.16 points – his strongest free skate of the season – more than 5 points ahead of Hanyu and just 0.67 behind Kazakhstan's Denis Ten. Overall, he outscored Olympic champion Yuzuru Hanyu (silver) and Olympic bronze medalist Denis Ten (bronze) for the gold medal, having received a total of 273.90 points. He became the first skater from Spain to win a world title in figure skating. During the 2015–16 Grand Prix series, Fernández won gold at both of his events, the 2015 Cup of China and 2015 Rostelecom Cup, and qualified for the 2015–16 Grand Prix Final in Barcelona. Second to Hanyu in both segments in Barcelona, he won silver in the Grand Prix Final for the second year in a row. In the free program, he landed his three planned quadruple jumps and scored 201.43 points, becoming the second skater in history to receive over 200 points in this segment. Fernández defended his national title at the Spanish Championships in December 2015, attempting and completing two quadruple jumps in the short program for the first time in his career (a quad toe loop in combination with a triple toe loop, and a quad Salchow). At the 2016 European Championships in Bratislava, Fernández successfully landed a quad toe loop-triple toe loop combination, quad Salchow, and triple Axel to score a new personal best of 102.54 points in the short program. With this score, he became only the second man in history to break 100 points in that segment. With a 14-point advantage going into the free skate, Fernández landed three quadruple jumps, but fell on the second triple Axel of the program (which he had just added). He scored 200.23 points, for a combined total of 302.77, becoming the second skater in history to cross the 300 point mark. He finished ahead of silver medalist Oleksii Bychenko by a margin of over 60 points. Entering the 2016 World Championships in Boston as the defending champion, Fernández opened his short program with a quad toe loop-triple toe loop combination, then fell on his quad Salchow attempt, but recovered to complete a triple Axel, two level-four spins and level-four footwork, scoring 98.52 points and securing second place. After the short program, he could do little practice due to a recurring bursa on the heel of his right foot. On the day of the free skate, the medical team of the event attended to his injury for several hours and helped him to alleviate the problem. Fernández entered the free skate segment with a 12.04 deficit behind Yuzuru Hanyu – the largest point gap at the time between first and second place after the short program in any discipline at a World Championships or Olympic Games under the ISU judging system. Fernández completed a clean free skate, which included three quads (a toe loop and two Salchows, one in combination with a triple toe loop), two triple Axels, four more triples as well as difficult spins and level-four footwork, and scored 216.41, surpassing his personal best in the segment by 14.98 points. He reached a total score of 314.93, also a new personal best. His free skating and total scores were the second and third highest, respectively, under the ISU judging system as of the event. Hanyu made mistakes in his free skate, allowing Fernández to close the point gap and overtake him by a further 19.76 points to become the 2016 World champion. According to a May 2016 news article, Fernández's income from shows is greater than his competitive earnings. When he won his second World title, Spain had 17 ice rinks, compared to a hundred in Toronto, and 300 licensed skaters, compared to about 15,000 in France. Fernández was assigned to the Rostelecom Cup and the Trophée de France for the 2016–17 Grand Prix series. He trailed Japan's Shoma Uno after the short program at the Russian Grand Prix event, having tripled one of his quad attempts. In the free skate, Fernández produced three quads, two triple Axels, and received the first 200+ long program score of the season: 201.43. One week later, he won both the short program and the free skate at the French Grand Prix, despite a fall in each segment of the event – on a quad toe loop in the short program, and a triple Axel in the free skate. He collected 15 points from both events and qualified for the 2016–17 Grand Prix Final with maximum points. At the Grand Prix Final in Marseille, Fernández placed third in the short program with 91.76 points, after landing a quad toe loop-triple toe loop combination, but stumbling on his quad Salchow and falling on the triple Axel. In the free skate, he tripled a planned quad toe loop, underrotated and stumbled on a quad Salchow and fell on his second triple Axel. He finished fourth in the free skate with 177.01 points and dropped to 4th place overall with a total score of 268.77. This was the first event since the 2014 Winter Olympic Games in which Fernández failed to make the podium. Fernández won his seventh national title at the Spanish Championships in December 2016. He landed two quads in his short program (the toe loop in combination with a triple toe loop, and the Salchow with a hand down) to take the lead, and followed with a free skate which included two quads (a toe loop and a Salchow) and two triple Axels (the first in combination with a triple toe loop – a new element for Fernández). The 2017 European Championships were held in Ostrava. Fernández skated a clean short program including two quads (one in combination with a triple), a triple Axel and all level four elements to claim first place in the segment and achieve a new personal best of 104.25 points. His free skate included three quads and seven triples, however he over-rotated his first quad Salchow and fell on the second. Fernández recovered to finish his routine and earned 190.59 points, winning the free skating segment over Russian Maxim Kovtun by over 18 points. Fernández received 294.84 points overall to win the gold medal, and became only the third men's skater to win five consecutive European titles, following Ondrej Nepela (1969–73), and Karl Schäfer, who won the title 8 consecutive times (1929–36). At the 2017 World Championships in Helsinki, Fernández set a new personal best in the short program, in which he successfully executed all the jump elements (a quad-triple toe loop combination, a quad Salchow and a triple Axel), three level four spins, and received maximum grades of execution from every judge for the step sequence. He received 109.05 points in the short program to take the lead, the third highest mark ever at the time of the event. Fernández started his free skate a quad toe loop, quad Salchow-triple toe loop and triple Axel-double toe loop, but fell on another quad Salchow attempt, doubled a planned triple flip and stumbled on the landing of the triple loop to finish 6th in the segment, dropping him to 4th place overall. It was the first time off the podium at a World Championships since 2012. Fernández began the season earlier than usual by participating in the Skate Canada Autumn Classic International. Although other skaters were now incorporating more quad jumps into their programs, Fernández stuck with two quads in the short program and three in the free program. He received 101.20 points for his short program after executing a quad toe loop-double toe loop, a quad Salchow, and a triple Axel, 11.52 points behind Yuzuru Hanyu. Fernández popped his first quad Salchow attempt during the free program, which was subsequently downgraded, but landed two clean quads and five triples to receive 177.87 points. He earned 279.07 points in total to overtake Hanyu and win the gold medal. Fernández competed for Team Europe at the Japan Open invitational tournament in Saitama, alongside Evgenia Medvedeva, Alina Zagitova and Oleksii Bychenko. He performed two quads and two triple Axels in his free skate, winning the men's discipline with 189.47 points. Team Europe narrowly beat Team Japan to win the overall competition. During the 2017–18 Grand Prix series, Fernández first competed in the 2017 Cup of China. He placed 3rd in the short program after popping his planned quadruple-triple combination, scoring 90.57 points. He made several mistakes in the free skate to finish 6th in this segment (162.49) and 6th overall (253.06). It was revealed after the competition that Fernández had been suffering from stomach problems. His second Grand Prix assignment was the 2017 Internationaux de France in Grenoble. Fernández won the short program with a clean skate for which he received 107.86 points, the 5th highest short program score on record at the time of the event. In the free skate, Fernández fell twice and stepped out of the landings of three other jumps to finish 2nd behind Shoma Uno in the segment with 175.85 points. His lead from the short program was enough to win the event overall with 283.71 points. This was the 7th career Grand Prix title for Fernández. In December 2017, Fernández claimed his 7th consecutive and 8th overall senior Spanish national title. He hit all planned jumps in the short program to receive 107.73 points, and landed two quads during the free skate before falling on the third to score 180.57 points in the segment and 288.30 points overall. His qualification for the 2018 Winter Olympics was not determined by this event, as it had been announced previously that Fernández would take the first of Spain's two spots in the men's discipline. Fernández announced that the 2018 Winter Olympics in PyeongChang would be his last Olympic Games. Fernández at the 2018 European Figure Skating Championships, where he claimed his sixth consecutive title. At the 2018 European Championships in Moscow, Fernández had a sizable lead following the short program, which included a quad-triple toe loop combination, a triple Axel and level 4 spins, but also a turn out on the landing of the quad Salchow. Fernández received 103.82 points in the segment, 12.49 points ahead of nearest rival Dmitri Aliev. Fernández hit two quads, two triple Axels and three other triples to win the free skating, but popped his third quad attempt to a triple and stumbled on a downgraded triple flip. He earned 191.73 points in the segment, improving on his previous season's best by nearly 14 points, and won the gold medal with a total of 295.55 points. Fernández became the first man in 82 years to have won the European Championships 6 consecutive times (2013–18). The other skaters who won at least six consecutive European titles are Karl Schäfer, Sonja Henie (1931–36), Katarina Witt (6 years, 1983–88), Marika Kilius / Hans-Jürgen Bäumler (1959–64), and Irina Rodnina (with two partners: Alexei Ulanov, 1969–72 and Alexander Zaitsev, 1973–78). At the 2018 Winter Olympics, Fernández skated his "Modern Times" short program, executing a quad-triple toe loop combination, a quad Salchow, a triple Axel and all level 4 elements. He received nine perfect 10.00 scores in program components and received 107.58 points, placing him second in that segment behind defending champion Yuzuru Hanyu. Fernández commented afterwards: "I'll say tomorrow I would be happy if I am in the same position. I have been training to be first, but we know how good a talent Yuzu is. He is really tough competition. I will fight all the way. And if I'm first, I'm first; if I'm second, I'm second; and if I'm third, I'm third. I'll be happy." In the free skate, Fernández landed a quad toe loop, a quad Salchow in combination, two triple Axels and five more triples, and earned four perfect 10.00 component marks. His only major mistake was popping a planned second quad Salchow into a double. His free skate performance earned 197.66 points  and a total competition score of 305.24 – both season's best for him. Fernández won the bronze medal behind Japan's Hanyu and Shoma Uno, the first ever figure skating Olympic medal for Spain. Speaking of his achievement, Fernández stated that "I finally got the medal I always wanted. I am proud I can take it home and share it with the people. It means a lot. For my country I hope it means a lot also. I know it means a lot for my family, they put so much effort, so much money, so much time into this. Same as me. I am sure they are as happy as I am. It means the world." In the figure skating gala, Fernández performed his aerobics class exhibition program wearing in a "Super Javi" Spanish-colored Superman costume. ; the program included parodies of Flashdance and iconic 1980’s workout jams. After the men's individual competition at the 2018 Winter Olympics concluded, Fernández returned to Madrid where he confirmed to Spanish media that he would not be competing at the 2018 World Championships in Milan. He cited his satisfaction with winning the bronze medal in PyeongChang to finish his season as the reason for the decision. Fernández also stated his intention to leave Canada, where he had trained since 2011, and return to Madrid to promote figure skating in Spain. Although he did not rule out future competitions entirely, he confirmed that he would not participate in another World Championships or Olympics. With the establishment of the new +5 / -5 Grade of Execution (GOE) scale at the start of the season, all previously recorded scores since the 2004 introduction of the ISU Judging System (IJS) were archived as historical statistics. During the 14 seasons the +3 / -3 GOE scale was in use, Fernández achieved the 2nd highest personal best short program score (109.05), the 3rd highest free skating score (216.41) and the 4th highest total score (314.93). Fernández decided to skip the 2018–19 Grand Prix series, and elected to skate at the Japan Open invitational tournament as his only competition during the first part of the season. He competed for Team Europe at the event, and placed 3rd among men with a score of 157.86 for his free program. Team Europe won the silver medal overall. On 28 November, Fernández officially stated that he would retire from competitive skating, with the 2019 European Figure Skating Championships as his last competition. Speaking about his decision, he expressed the need to think about the level of competition he wanted to be at, because he felt his body and mind were no longer there, which he had to accept. He added that he preferred to retire at the right time, when he was satisfied with his career and had plans for the future, referring among other projects to his Revolution ON Ice skating show, with which he toured Spain in November and December 2018. The news of his retirement was widely reported in Spanish as well as global media. It was also confirmed that Fernández would not compete at the Spanish National Championships in December. Fernández returned to his Toronto base in early January to train for three weeks leading up to the 2019 European Figure Skating Championships. As a tribute to his home country, he selected two Spanish themed programs from his earlier repertoire for his final competition: Malagueña as the short program, and Man of La Mancha for the free skate. "I have chosen these two programs to pay tribute to all those fans who with their flags gave me the strength to continue fighting and give the best of myself in so many places around the world." Fernández placed third in the short program at European Championships with 91.84 points after stepping out of the landing of the triple Axel and receiving an underrotation call on his quad Salchow. Fernández was displeased with his scores: "I've seen mistakes today in figure skating I've not seen in my whole life. I had a cheated quad Salchow today that was not [cheated]. I saw it on the ice and it was not." Referring to the 8.65 point lead Russia's Mikhail Kolyada had over him after the short program, he said: "I'm known for comebacks so if they let me tomorrow, I'll do it." In the free skate, Fernández landed two quads (with a turnout on the landing of the second jump of his quad-triple toe loop combination), two triple Axels and three more triples, but missed out on his triple flip attempt. He finished first in the segment with 179.75 points, receiving the highest free program component scores (94.20) since the introduction of the revised scoring system at the start of the season, and rose from third to first overall with 271.59 points. Fernández retired from competitive figure skating with the third highest number of consecutive European titles behind pairs skater Irina Rodnina (who had won 10) and men's skater Karl Schäfer (with 8). Commenting on what he leaves behind as legacy, Fernández stated: "I think it's good for the world to know that not only skaters from strong countries can appear. I'm from Spain, I’ve got a friend here at my side from Italy [bronze medalist Matteo Rizzo] and another from Russia [silver medalist Alexander Samarin]. Everyone has his own story to tell and it's good that everyone does not come from a strong figure skating country because that means more stories to tell to everyone. I hope I can develop skating more in my home country to try and make it bigger, but I hope with the work I was able to do I've made history and in 20 years some people will still recollect my name." As for what heritage he would like to leave to skaters, he said: "I would like to leave behind a question to think about. What do they prefer: jumps, skating skills or performance? I would like to see these from more skaters. I think this is what our sport needs – complete skaters who embody something from every aspect of the sport." When asked about what his student's legacy to the sport will be, long-time coach Brian Orser said: "For me and Tracy [Wilson, coaching partner], he is our “poster child,” the very example of what we do with our style of training and coaching. He has done something great for men’s skating. He is a perfect model for what male skating should be: athletic and aesthetic, bringing a very personal style. He is also the young boy from Spain who made it. This is something very important and special about him. He promotes skating in his home country, through his shows all over Spain and skating camps. I’ve seen him teaching. He teaches technique and style the way we do. This makes me very proud. He will be an excellent coach." T = Team result, P = Personal result; Medals awarded for team result only. ^ "ISU Judging System – Season Bests Total Scores 2017/2018: Men". International Skating Union. 2 April 2018. ^ "ISU Judging System – Season Bests Total Scores 2016/2017: Men". International Skating Union. 11 April 2017. ^ "ISU Judging System – Season Bests Total Scores 2015/2016: Men". International Skating Union. 26 April 2016. ^ "ISU Judging System – Season Bests Total Scores 2014/2015: Men". International Skating Union. 18 April 2015. ^ "ISU Judging System – Season Bests Total Scores 2013/2014: Men". International Skating Union. 24 January 2013. ^ "ISU Judging System – Season Bests Total Scores 2012/2013: Men". International Skating Union. 13 April 2013. ^ "ISU Judging System – Season Bests Total Scores 2011/2012: Men". International Skating Union. 31 March 2012. Retrieved 16 April 2012. ^ "ISU Judging System – Season Bests Total Scores 2010/2011: Men". International Skating Union. 28 April 2011. Retrieved 18 June 2011. ^ "ISU Judging System – Season Bests Total Scores 2009/2010: Men". International Skating Union. 25 March 2010. Retrieved 18 June 2011. ^ "ISU Judging System – Season Bests Total Scores 2008/2009: Men". International Skating Union. 28 April 2009. Retrieved 18 June 2011. ^ a b "ISU Judging System – Personal Best: Men Short Program Score". International Skating Union. 28 January 2016. Archived from the original on 30 January 2016. ^ a b "ISU Judging System – Personal Best: Men Free Skating Score". International Skating Union. 28 January 2016. Archived from the original on 30 January 2016. ^ a b "ISU Judging System – Personal Best: Men Total Score". International Skating Union. 28 January 2016. Archived from the original on 30 January 2016. ^ "ISU Judging System – Personal Best: Men Short Program Score". International Skating Union. 2 April 2016. Archived from the original on 2 April 2016. ^ "ISU Judging System – Personal Best: Men Free Skating Score". International Skating Union. 2 April 2016. Archived from the original on 12 April 2016. ^ "ISU Judging System – Personal Best: Men Total Score". International Skating Union. 2 April 2016. Archived from the original on 4 April 2016. ^ "Javier Fernandez (ESP) claims historic gold medal". International Skating Union. 26 January 2013. Archived from the original on 14 December 2014. Retrieved 13 December 2014. ^ a b "ISU Grand Prix of Figure Skating: Skate Canada International, Day 2". International Skating Union. 29 October 2011. Archived from the original on 14 December 2014. Retrieved 13 December 2014. ^ a b "El patinador Javier Fernández recibe la Medalla de Oro al Mérito Deportivo" [The skater Javier Fernandez receives the Gold Medal for Sporting Merit]. El Huffington Post (in Spanish). Europa Press. 19 April 2016. ^ a b c d e f g Hermida, Xosé (20 May 2016). "Javier Fernández, the new king of Spanish sport". El País. Original: Hermida, Xosé (8 May 2016). "Javier Fernández, el nuevo rey del deporte español". El País (in Spanish). ^ a b c d e f g Hersh, Philip (29 March 2016). "Fernández' path to success unlikely as they come". IceNetwork.com. ^ a b c d Mittan, Barry (28 September 2009). "Fernández Makes Senior Grand Prix Debut". GoldenSkate.com. ^ a b "Interview with Javier Fernandez at Nebelhorn-Trophy, September 2011". FigureSkating-Online. 7 October 2011. Archived from the original on 1 January 2012. ^ Bőd, Titanilla (30 June 2010). "Javier Fernandez – a great skater who can even cook!". AbsoluteSkating.com. ^ a b c d e "ENTREVISTA – Javier Fernández: "Si sigo trabajando, puedo estar en lo más alto"" [Interview – Javier Fernández: If I keep working, I can go far]. Hielo Español (in Spanish). 16 June 2011. Archived from the original on 1 January 2012. ^ Kirk, Jennifer (2 July 2015). "Our Interview with Miki Ando and Javier Fernandez". The Skating Lesson. The Skating Lesson. ^ Escudero, Emilio V. (12 February 2014). "Sochi 2014: "El niño que tenía miedo al hielo"". abc.es. ^ a b c Durán, Santi (16 December 2011). "Javier Fernández: El señor del hielo" [Javier Fernandez: Lord of the ice]. Mundo Deportivo (in Spanish). Archived from the original on 1 January 2012. ^ Iribar, Amaya (27 January 2013). "Nureyev sobre hielo". El Pais (in Spanish). ^ a b c Nuñez Jaime, Víctor (8 August 2013). "El chico que desafía al hielo". El Pais (in Spanish). ^ Herrmann, Suzanne (Summer 2009). "Javier Fernandez – "The Season Ahead"". AbsoluteSkating.com. ^ "Spanish ice pioneer Javier Fernández dreams of a figure skating medal". olympic.org. 5 February 2014. ^ "ISU 2010 Grand Prix assignments – Men". International Skating Union. Archived from the original on 8 December 2015. ^ Luchianov, Vladislav (17 May 2011). "Fernandez trying to make skating popular in Spain". IceNetwork. Archived from the original on 1 January 2012. ^ Flade, Tatjana (1 January 2012). "Fernández makes figure skating history – again". Golden Skate. ^ a b c Smith, Beverley (28 October 2011). "World champions tumble at Skate Canada". The Globe and Mail. ^ Rutherford, Lynn (26 November 2011). "Hanyu sneaks past Fernandez by a whisker". IceNetwork. Retrieved 19 December 2011. ^ Flade, Tatjana (10 December 2011). "Chan leads men at Grand Prix Final". Golden Skate. Retrieved 16 December 2011. ^ Flade, Tatjana (11 December 2011). "Chan repeats as Grand Prix Final Champion". Golden Skate. Retrieved 16 December 2011. ^ Cernuda, Olalla (12 December 2011). "El patinador Javier Fernández consigue una historica medalla de bronce en la final del Grand Prix" [Skater Javier Fernandez wins a historic bronze medal at the Grand Prix Final]. ABC.es (in Spanish). Archived from the original on 1 January 2012. ^ "European tour: National championships roundup". Icenetwork. 19 December 2011. ^ Flade, Tatjana (29 January 2012). "Plushenko takes seventh European title". Golden Skate. ^ Kondakova, Anna (31 March 2012). "Chan wins second consecutive World title". Golden Skate. ^ a b Sciarrillo, Laura (24 October 2012). "Javier Fernandez: I like to try different styles". ArtOnIce.it. ^ "ISU Grand Prix Final 2012: MEN FREE SKATING JUDGES DETAILS PER SKATER" (PDF). International Skating Union. ^ "2006 Cup of Russia – Bosco Sport: MEN FREE SKATING JUDGES DETAILS PER SKATER" (PDF). International Skating Union. ^ Elfman, Lois (27 December 2012). "No rest for Spain's Fernandez this holiday season". IceNetwork. ^ Bőd, Titanilla (5 February 2013). "Javier Fernandez: "One competition doesn't make you anything"". Absolute Skating. ^ Flade, Tatjana (24 January 2013). "Amodio leads men at 2013 Europeans; Plushenko withdraws". Golden Skate. ^ Flade, Tatjana (26 January 2013). "Spain's Javier Fernandez captures European title; makes history". Golden Skate. ^ Sarkar, Pritha (11 March 2013). "Fernandez enjoys last laugh over bullies". Reuters. ^ Pyette, Ryan (11 March 2013). "Brian Orser's skaters set to challenge Patrick Chan". The London Free Press. Vancouver 24 hrs. ^ Sarkar, Pritha (1 February 2014). "INTERVIEW-Olympics-Figure skating-Fernandez chases blades of glory". Reuters. ^ de Carbonnel, Alissa (8 February 2014). "Fernandez sticks to 'lucky' boots in Sochi". Reuters. ^ "Anna Cappellini/Luca Lanotte (ITA) dance off with gold" (Press release). International Skating Union. 16 January 2014. Archived from the original on 3 February 2014. ^ "Javier Fernandez (ESP) strikes gold, repeats as champion" (Press release). International Skating Union. 18 January 2014. Archived from the original on 20 January 2014. ^ Tone, Florentina (24 January 2014). "Javier Fernandez will be Spain's flag-bearer in Sochi". Inside Skating. ^ "XII Olympic Winter Games – Men Free Skating – Judges Scores" (PDF). International Skating Union. 14 February 2014. ^ "ISU World Figure Skating Championships 2014 Pairs and Men's Short Program" (Press release). International Skating Union. 26 March 2014. Archived from the original on 22 October 2015. ^ Armstrong, Jim (28 March 2014). "Olympic champ Hanyu wins world figure skate title". Associated Press. ^ Russell, Susan D. (6 May 2015). "Javier Fernandez: A Hero in his Homeland". International Figure Skating. ^ Zaccardi, Nick (12 December 2014). "Yuzuru Hanyu falls, still tops Grand Prix Final short program (video)". NBC Sports. ^ Tronchoni, Nadia (13 December 2014). "Fígaro vale una medalla de plata". El País (in Spanish). ^ "ISU Grand Prix of Figure Skating Final Day Three" (Press release). International Skating Union. 12 December 2014. ^ "Javier Fernandez (ESP) wins Men's Short Program" (Press release). International Skating Union. 28 January 2015. ^ Berlot, Jean-Christophe (30 January 2015). "Fernández takes third straight gold medal at Euros". IceNetwork. ^ Kany, Klaus-Reinhold (27 March 2015). "Raucous crowd cheers Hanyu to lead during short; Fernández in second; Music mishap plagues Ten; Brown in contention". IceNetwork. ^ "ISU World Figure Skating Championships 2015: MEN SHORT PROGRAM JUDGES DETAILS PER SKATER" (PDF). International Skating Union. 27 March 2015. ^ "ISU World Figure Skating Championships 2015 – Men Free Skating" (Press release). International Skating Union. 28 March 2015. ^ Zaccardi, Nick (28 March 2015). "Javier Fernandez wins upset World Championship; top American fourth". NBC Sports. ^ "ISU Grand Prix of Figure Skating 2015/16 – Men" (PDF). International Skating Union. Archived from the original (PDF) on 15 June 2015. Retrieved 15 June 2015. ^ "Judges Scores for Senior Men Short Program, Spanish National Figure Skating Championships 2015" (PDF). Royal Spanish Ice Sports Federation. 19 December 2015. ^ "Javier Fernández se eleva el listón". Marca. 19 December 2015. ^ Flade, Tatjana (28 January 2016). "No match for Fernandez in Europe". Golden Skate. ^ Smith, Beverly (2 April 2016). "Fernandez: skate of a lifetime". Beverly Smith: A figure skating insider. ^ Graham, Bryan Armen (1 April 2016). "Fernandez defends figure skating world title with stunning comeback". The Guardian. ^ "Javier Fernandez (ESP) skates to gold" (Press release). International Skating Union. 1 April 2016. ^ Decool, Mélissa (2 April 2016). "Fernandez wins second consecutive World title". Golden Skate. ^ Heredia, Sergio (4 April 2016). "Cómo es posible que Javier Fernández gane en patinaje sobre hielo siendo español" [How is it possible for Javier Fernández to win in figure skating being Spanish?]. La Vanguardia (in Spanish). ^ Sánchez, Jesús (7 April 2016). "Javier Fernández, una flor en el desierto" [Javier Fernández, a flower in the desert]. Marca (in Spanish). ^ "2016 Rostelecom Cup Men Short Program Judges Scores" (PDF). International Skating Union. 4 November 2016. ^ "2016 Rostelecom Cup Men Free Skating Judges Scores" (PDF). International Skating Union. 5 November 2016. ^ "2016 Trophée de France Men Short Program Judges Scores" (PDF). International Skating Union. 11 November 2016. ^ "2016 Trophée de France Men Free Skating Judges Scores" (PDF). International Skating Union. 12 November 2016. ^ "Medvedeva (RUS), Fernandez (ESP), Papadakis/Cizeron (FRA), Savchenko/Massot (GER) take gold in Franc" (Press release). International Skating Union. 12 November 2016. Archived from the original on 14 November 2016. ^ "2016 Grand Prix Final – Men Short Program scores" (PDF). International Skating Union. 8 December 2016. ^ "2016 Grand Prix Final – Men Free Skating scores" (PDF). International Skating Union. 10 December 2016. ^ "2016 Grand Prix Final – Men results". International Skating Union. 10 December 2016. ^ "Fernández, Matos, y Hurtado y Khalyavin se llevan el Campeonato de España". Marca. 18 December 2016. ^ "2017 European Figure Skating Championships – Men Short Program Scores" (PDF). International Skating Union. 27 January 2017. ^ "2017 European Figure Skating Championships – Men Free Skating Scores" (PDF). International Skating Union. 28 January 2017. ^ "ISU European Figure Skating Championships 2017 – Men". International Skating Union. 28 January 2017. ^ Decool, Mélissa (29 January 2017). "Spain's Fernandez remains undefeated in Europe; takes fifth crown". Golden Skate. ^ "Judges Scores – 2017 World Championships – Men Short Program" (PDF). International Skating Union. 30 March 2017. ^ "Score over 150 – Men". International Skating Union. 1 April 2017. ^ "Judges Scores – 2017 World Championships – Men Free Skating" (PDF). International Skating Union. 1 April 2017. ^ Bőd, Titanilla (12 April 2017). "Javier Fernandez: "It is what it is, I have to learn from it"". Absolute Skating. ^ Bellón, Juanma (21 September 2017). "Patinaje: Superjavi: año olímpico de Chaplin y Don Quijote". Diario AS. ^ "Judges Scores, Autumn Classic International, Men Short Program" (PDF). Skate Canada. 22 September 2017. ^ "Yuzuru Hanyu falters as Javier Fernández wins opener". NBC Sports. 24 September 2017. ^ "Judges Scores, Autumn Classic International, Men Free Skating" (PDF). Skate Canada. 23 September 2017. ^ "Japan Open 2017 Judges Scores - Men Free Skating" (PDF). Japan Skating Federation Official Results & Data Site. 7 October 2017. ^ "Japan Open 2017". Japan Skating Federation Official Results & Data Site. 7 October 2017. ^ "ISU GP Audi Cup of China 2017 - Men". International Skating Union. 4 November 2017. ^ Flade, Tatjana (4 November 2017). "Kolyada (RUS) wins his first Grand Prix gold at Audi Cup of China". International Skating Union. ^ Flade, Tatjana. "Fernandez (ESP) soars past field in Men's Short Program - ISU". www.isu.org. Retrieved 19 November 2017. ^ Flade, Tatjana. "Fernandez (ESP) claims seventh Grand Prix gold medal of his career - ISU". www.isu.org. Retrieved 19 November 2017. ^ "2017 Spanish National Championships Senior Men SP" (PDF). ^ "2017 Spanish National Championships Senior Men FS" (PDF). ^ "Criterios de selección de patinaje artístico para los JJOO". Federación Española Deportes de Hielo (in Spanish). Retrieved 1 January 2018. ^ "Javier Fernández: "Estos son mis últimos Juegos; seguir sería una locura"". abc (in Spanish). Retrieved 1 January 2018. ^ "2018 European Championships - Men Short Program Judges Details" (PDF). ^ "2018 European Championships - Men Free Skating Judges Details" (PDF). ^ "2018 Winter Olympics - Men Single Skating Short Program Scores" (PDF). ^ Duran, Andres. "Hanyu returns in style to competition, wins Men's Short Program - ISU". www.isu.org. Retrieved 16 February 2018. ^ "2018 Winter Olympics - Men Single Skating - Free Skating Scores" (PDF). ^ "Olympic Winter Games PyeongChang 2018 - Men Single Skating". www.isuresults.com. Retrieved 17 February 2018. ^ "Yuzuru Hanyu defends Olympic title in Pyeongchang". Golden Skate. 17 February 2018. ^ Baty, Emma (27 February 2018). "This Figure Skater Did Pushups in His Final Routine and the Crowd Was Loving It". Cosmopolitan. ^ Fox, Tania Ray (25 February 2018). "Javier Fernandez aka Super Javi delivers the must-see performance of the Olympics". Yahoo! Sports. ^ "Javier Fernández: "No voy a ir al Mundial"". Marca. 20 February 2018. ^ "Javier Fernández regresará a España tras nueve años entrenándose en el extranjero". El País. 20 February 2018. ^ "Personal Best Scores". www.isuresults.com. Retrieved 30 November 2018. ^ "Javier Fernandez to skip Grand Prix, still compete next season". OlympicTalk. 19 June 2018. Retrieved 30 November 2018. ^ "Japan Open 2018". www.jsfresults.com. Retrieved 30 November 2018. ^ "Javier Fernandez confirms figure skating retirement plan". OlympicTalk. 28 November 2018. Retrieved 30 November 2018. ^ "Javier Fernández confirma que se retirará en 2019". Marca.com (in Spanish). Retrieved 30 November 2018. ^ EFE (28 November 2018). "Javier Fernández anuncia su retirada tras el Campeonato Europeo de patinaje artístico de 2019". El País (in Spanish). ISSN 1134-6582. Retrieved 30 November 2018. ^ "Javier Fernández confirma su retirada deportiva en 2019". AS.com (in Spanish). Retrieved 30 November 2018. ^ "Javier Fernández se retira del patinaje: dentro de dos meses dirá adiós". El Confidencial (in Spanish). Retrieved 30 November 2018. ^ "Two-time world champion Javier Fernandez to retire after European championships: reports". The Japan Times Online. 29 November 2018. ISSN 0447-5763. Retrieved 30 November 2018. ^ "Le patineur espagnol Javier Fernandez annonce sa retraite". Le Monde.fr (in French). Retrieved 30 November 2018. ^ "羽生の盟友フェルナンデス、1月欧州選手権を最後に引退へ　平昌五輪銅メダルの27歳（THE ANSWER） - Yahoo!ニュース". Yahoo!ニュース (in Japanese). Retrieved 30 November 2018. ^ "Eiskunstlauf: Weltmeister Javier Fernandez tritt zurück". bild.de (in German). Retrieved 30 November 2018. ^ "Así será la retirada de Javier Fernández del patinaje de competición | HIELO ESPAÑOL". hieloespanol.es (in Spanish). Retrieved 30 November 2018. ^ "Javier Fernández busca un broche histórico para rematar su carrera | HIELO ESPAÑOL". hieloespanol.es (in Spanish). Retrieved 28 January 2019. ^ Paula Slater (24 January 2019). "Kolyada grabs eight-point lead in Minsk". Golden Skate. Retrieved 28 January 2019. ^ "2019 European Figure Skating Championships - Men Short Program press conference" (PDF). ^ Paula Slater (26 January 2019). "Fernanez snags seventh consecutive European title". Golden Skate. Retrieved 28 January 2019. ^ "2019 European Figure Skating Championships - Men Free Skating press conference" (PDF). ^ "„Te akarod otthagyni a sportot, vagy azt akarod, hogy a sport hagyjon ott téged?"". ujszo.com (in Hungarian). Retrieved 28 January 2019. ^ Berlot, Jean-Christophe (24 January 2019). "Brian Orser gives updates on students Javier Fernandez, Yuzuru Hanyu and Yevgenia Medvedeva". OlympicTalk. Retrieved 28 January 2019. ^ "Javier Fernández galardonado como mejor deportista de 2014 por el COE". Hielo Español (in Spanish). 16 December 2014. ^ "Otros Deportes Sandra Sánchez, Lydia Valentín, Javier Fernández y Regino Hernández, entre los premiados por el COE" (in Spanish). Marca.com. 21 November 2018. Retrieved 22 November 2018. ^ "Javier Fernández, Ruth Beitia scoop National Sports Awards". Marca España. Retrieved 2 March 2018. ^ Trueba, Juanma (15 December 2015). "Javier Fernández, Marín, Ruth Beitia y Badosa, Premios AS | Polideportivo | AS.com". Diario AS (in Spanish). Retrieved 19 April 2016. ^ "Javier Fernández, Sandra Aguilar y Eva Calvo, premiados por la APDM". Marca (in Spanish). 30 January 2017. ^ "Los undécimos Premios Ussía ya tienen galardonados" (in Spanish). La Razón. 21 February 2019. Retrieved 26 February 2019. ^ "Spanish Football Spanish royal family attend MARCA's 80th anniversary". MARCA in English. 13 December 2018. Retrieved 14 December 2018. ^ "Bahamontes, Belmonte, Casillas, Perales y Javier Fernández, protagonistas de la Gala Marca". AS.com. 13 December 2018. Retrieved 14 December 2018. ^ "Javier Fernández recibe el MARCA Leyenda, en directo" (in Spanish). MARCA. 7 March 2019. Retrieved 13 March 2019. ^ "Javier Fernandez recibe la Gran Cruz de la Orden del 2 de mayo" (Press release) (in Spanish). Comunidad de Madrid. 8 May 2015. ^ "Javier Fernández recibe la Medalla de Oro de Madrid". Marca (in Spanish). 15 May 2017. ^ "Javier Fernández, Medalla de Oro de la Comunidad de Madrid". Marca (in Spanish). 11 April 2017. ^ "Javier FERNANDEZ: 2018/2019". International Skating Union. Archived from the original on 24 January 2019. ^ a b c d Revolution on Ice 2018 (Television production). Gol Televisión. 1 January 2019. ^ a b Smith, Beverley (9 May 2018). "Javier Fernandez: A Promise". BEV SMITH WRITES An Insider's Look at Figure Skating. ^ a b c Vasilyeva, Nadia; Tone, Florentina (10 December 2015). "Javier Fernández: "Being World champion doesn't really change anything in me"". Inside Skating. ^ a b c 中村, 真由美 (27 June 2015). "VOGUEエディターの「あの人に会いたい！」宮本賢二 編。" [VOGUE editor: "I want to see that person!" Episode Kenji Miyamoto]. Condé Nast Japan (in Japanese). ^ Xiong, Wei [@pandaatlarge] (26 May 2017). "For next season's SP, Yuzuru Hanyu will go back to "Ballad No.1" by Chopin with upgraded layout, Javier Fernandez also reuses Chaplin Medley" (Tweet) – via Twitter. ^ Lamelas, Pedro (11 August 2017). "Javier Fernández, un Don Quijote sobre hielo". Marca (in Spanish). ^ 2017 Golden Skate Interview with Javier Fernández (YouTube). Golden Skate. 24 September 2017. ^ "Javier FERNANDEZ: 2017/2018". International Skating Union. Archived from the original on 5 August 2018. ^ "木下グループ presents スターズ・オン・アイス 2018 (Special)". TBS 2. 21 April 2018. ^ 木下グループ presents スターズ・オン・アイス 2018 (Television production). TBS 2. 6 April 2018. ^ @absoluteskating (24 February 2018). "#PyeongChang2018 #FigureSkating Olympic gala timing and music selections" (Tweet) – via Twitter. ^ a b c d e Bőd, Titanilla (27 February 2015). "Javier Fernandez: "It was the toughest competition I've ever had"". Absolute Skating. ^ 2018 European Figure Skating Championships Exhibition (Television production). Match TV. 21 January 2018. ^ a b c "Un buon Javier Fernandez precede Takahito Mura nel corto di Skate Canada" [Javier Fernandez better than Takahito Mura in the short program at Skate Canada]. NEVEITALIA (in Italian). 1 November 2014. ^ 2017 Internationaux de France Exhibition (Television production). Eurosport 1. 19 November 2017. ^ a b c d Nemetz, Andrea (28 April 2016). "Reigning world men's and pairs champions join returning favourites for Stars On Ice". Local Xpress. ^ a b Fantasy on Ice 2017 in Makuhari (Television production). BS Asahi. 28 May 2017. ^ "Javier Fernández se marca como meta los Juegos del 2018" [Javier Fernandez marked the 2018 Games as the target]. El Mundo Deportivo (in Spanish). 18 July 2015. ^ "Los nuevos programas de Javier Fernández se crearán en España" [The new programs of Javier Fernandez will be created in Spain]. Hielo Español (in Spanish). 22 July 2015. ^ Nemetz, Andrea (30 April 2016). "Skaters showcase love of the sport at Stars on Ice". Local Xpress. ^ "木下グループpresents　スターズ・オン・アイス2016 - 滑走順＆曲目" [Kinoshita Group presents Stars on Ice 2016 – Program list] (in Japanese). TBS. Archived from the original on 22 June 2016. Retrieved 29 April 2016. ^ 2016 ISU World Figure Skating Championships: Exhibition Gala (Television production). USA: NBCSN. 3 April 2016. ^ a b Bertulini, Anna (18 January 2016). "Art on Ice 2016". Absolute Skating. ^ Flade, Tatjana (4 January 2015). "Spain's Fernandez aims for third European title". Golden Skate. ^ "Javier Fernández patinará su nuevo programa libre a ritmo de blues y jazz" [Fernandez will skate his free program to blues and jazz]. Hielo Español (in Spanish). 26 August 2013. ^ "Javier Fernández vuelve a apostar por el estilo jazzy para el programa corto" [Fernandez' short program will be jazz]. Hielo Español (in Spanish). 27 August 2013. ^ Remmel, Ia (22 February 2014). "Choreography that inspires". Absolute Skating. ^ a b "スターズオンアイス2014：STARS ON ICE JAPAN TOUR 2014 : テレビ東京 - 公演滑走順" [Stars on Ice Japan tour 2014: TV Tokyo – Program] (in Japanese). TV Tokyo. 16 April 2014. Archived from the original on 19 July 2014. ^ a b c d "Competition Results: Javier FERNANDEZ". International Skating Union. ^ "Kinoshita Group Cup Japan Open 2013". Japan Skating Federation Official Results & Data Site. Archived from the original on 19 October 2013. ^ "Kinoshita Group Cup Japan Open 2014". Japan Skating Federation Official Results & Data Site. Archived from the original on 4 October 2014. Wikimedia Commons has media related to Javier Fernández.